We are pleased to announce that the 2019 competition will be open for entries on 1st October 2018. 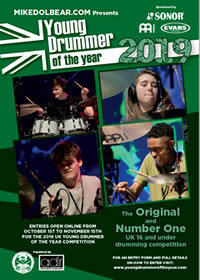 Now in its 17th consecutive year, this competition continues to go from strength to strength and each year we are blown away by the amazing talents shown by the UK’s young drummers. We are delighted to have Sonor drums, Meinl cymbals and Evans drumheads on board as our sponsors this year, in what we hope will be another successful competition. This year we will again be accepting online entries only and these will be accepted any time between 1st October and 15th November 2018. Please read our How to Enter page for full details and instructions. For any queries, please read our FAQs page, as you will probably find the answer to any questions there. The finals of this year’s event will be held at a midland theatre on 3rd February 2019. More details to follow – keep watching this website!